There’s big money ahead for Fitbit and Google’s (s GOOG) Project Glass: Wearable computing will grow to a $1.5 billion business within the next two years, according to a new Juniper study that is identifying 2014 as the watershed year for the wearable device sector. 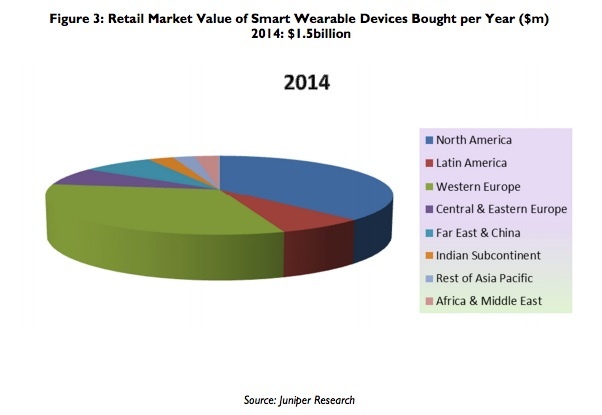 Juniper believes that the wearable computing industry will see revenue of $800 million this year. It is worth noting that Juniper’s definition of wearable computing includes both emerging technology like Google’s Project Glass as well as more established smart watches and wearable health and fitness gizmos. Speaking of which: Nike’s VP of Digital Sport Stefan Olander will be at our RoadMap conference in San Francisco next Monday, and we will make sure to ask him about his take on Juniper’s numbers. The report also mentions wearable computing devices worn by soldiers in combat, but didn’t include them in the revenue forecast, likely because you may not find them on the shelves of your local Apple (s AAPL) store any time soon. Now that we know that wearable computing is big business, one question remains: How will consumers actually use them in the future? That’s especially interesting when it comes to devices like Glass, which could lead to a whole new generation of localized, augmented media as well as a new wave of apps that come with close tie-ins to the real world – something that I recently explored in my story If the world were your platform, what apps would you build?.